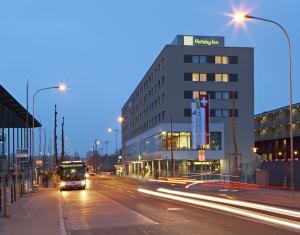 The Holiday Inn Zürich Messe is ideally located between the airport and the city center in an emerging business district. The hotels surroundings are embossed by the pulsating life of Switzerland’s most famous concert and music venue hall Hallenstadiom as well as the Exhibition Centre Zurich and the musical hall Theater 11 with its events of international appeal. All these top spots are right across the street within a few meters from the Holiday Inn Zürich Messe.All 164 comfortable non smoking rooms are decorated with the latest contemporary design and offer free high speed internet access and wifi.The technical amenities of the seven meeting rooms will meet all your requirements: our individually programmable multimedia technology and competent meeting hosts will ensure that you can concentrate exclusively on your meeting. At lunchtime, we either serve three courses of easy-to-digest finger food delights or, should you plan a longer lunch breack, we can offer a business lunch in our Brasserie Bits&Bites.Public transportation is conveniently available in front of the hotel. A direct tram takes you to the city centre in only 17 minutes or to the airport in only 15 minutes. If travelling on the motorway from any direction, follow the sign (((Z))) to the Zürich Exhibition Centre. Our hotel is situated opposite the Exhibition Centre. For hotel guests is our Parking available. The seven meeting rooms will not only impress you with their elegant wooden flooring and warm colour scheme, but also with their bright atmosphere, created by natural light. The technical amenities will meet all your requirements: our individually programmable multimedia technology and competent meeting hosts will ensure that you can concentrate exclusively on your meeting. At lunchtime, we either serve three courses of easy-to-digest finger food delights or, should you plan a longer lunch break, we can offer a business lunch in our Brasserie Bits&Bites.